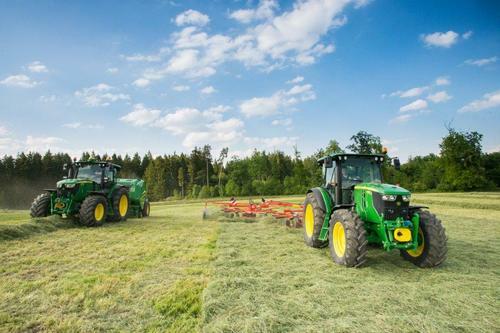 John Deere is introducing three new, more compact models to both the 6M and 6R Series tractor ranges. Built in Mannheim, the new 6MC and 6RC tractors have been designed specifically for medium size arable, livestock and mixed farms, and are also suitable for local authorities and other professional grounds and turf care customers. The new 6090MC, 6100MC and 6110MC models are equipped with smooth, highly efficient PowrQuad Plus transmissions and Stage III B compliant 4.5-litre four-cylinder PowerTech PWX engines. Using field proven technologies to meet the latest emissions standards, these fuel efficient diesel-only engines feature exhaust gas recirculation (EGR), a wastegate turbocharger and an exhaust filter. This last component includes a diesel oxidation catalyst (DOC) and a diesel particulate filter (DPF). The 6MC tractors feature a 2.4m wheelbase for stability and versatility, while an optional low profile cab allows easy access to small buildings. The tractors’ durable full frame is specifically designed to accept front loaders such as the John Deere H310 or H340. These are available in non self-levelling, mechanical self-levelling and hydraulic self-levelling versions, with a wide variety of loader attachments. With up to four mechanical SCVs, the pressure compensated hydraulic system provides quick response times and a lift capacity of up to 5600kg. It is available with a 65 or 80-litre/min capacity pump. These tractors also feature a fuel efficient 540/540E/1000rpm PTO plus a comfortable cab with 320 degree visibility and low noise levels. John Deere’s 6090RC, 6100RC and 6110RC tractors represent the premium version of this new line of more compact tractors. Supplied by a massive 205-litre fuel tank, the John Deere PowerTech PWX 4.5-litre Stage III B diesel-only engines are also equipped with Intelligent Power Management (IPM) with 10 additional hp when needed. Operator comfort is enhanced by the tractors’ 2.4m wheelbase and triple link suspension (TLS) front axle, while tyre sizes of up to 600/65 R38 help apply the available power to the ground. Increased levels of comfort as well as a higher degree of implement control through automation are provided by John Deere’s iTEC Basic, GreenStar and ISOBUS precision farming options. The three powershift transmission choices, PowrQuad Plus, AutoQuad Plus and AutoQuad Plus EcoShift, provide smooth gear changes on the move, assisted by a standard declutch button. Thanks to the newly available EcoShift mode, engine rpm is automatically reduced when reaching high speeds. These reliable and efficient transmission options help to further reduce fuel consumption on these tractors. Other features include a pressure and flow compensated hydraulic system providing up to 114 litres/min, with 37 litres available for implement operation, plus an optional ex-factory front PTO and front hitch with a lift capacity of 3000kg. John Deere’s new 6RC and 6MC Series tractors will be available from November 2013.